This is one of those rare encounters that could only have taken place in the twenty first century. A few months ago on twitter, on the ‘similar to you’ listing was a very interesting sounding girl living in Vancouver, Canada. It could have verged on twitter stalking, yet luckily it didn’t as we discovered through our tweets that we had similar interests and ideas. I was keen to learn more about her. So I sent her an old fashioned email. It turned out that Aleksandra Nasteska is the National co-Director and a founding member of a Canadian civil society organisation, We Canada. It is a nation-wide initiative for sustainability, pressing for Canadian leadership at the Rio+20 United Nations Conference on Sustainable Development, popularly known as the Earth Summit 2012. Not only that, but through our internet ramblings and skype chat, much more emerged. Aleksandra is originally from Macedonia and built a career as a youth speaker on women’s issues and as a television host and producer before relocating to Vancouver to study acting. 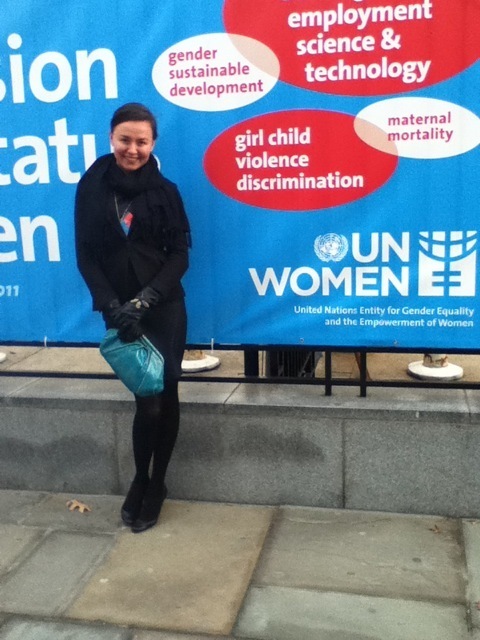 In addition to directing a team at We Canada, she currently sits on the United Nations Environmental Programme Youth Steering Committee for Rio+20 and recently led a We Canada delegation at the UN Tunza Youth Conference in Indonesia. As a passionate advocate for the environment,the multi-talented multi-tasker shares her views on her work with We Canada, the importance of putting your best foot forward and a few childhood tales. What is the We Canada initiative and what is it trying to achieve? We Canada is a nation-wide civil society initiative for Canadian leadership at the United Nations Conference on Sustainable Development, popularly known as the Earth Summit 2012. It is to raise the profile of the Earth Summit 2012 and to engage Canadians in policy beyond voting. We want the government to know we are watching them and we are collaborating with our partner organisations to bring policy recommendations to the Summit from civil society. We want the world to see that Canadians support the necessary changes and we seek to collaborate with the international community to make Earth Summit 2012 a successful one. As National co-Director of We Canada, what is your role? At the beginning, the focus was on developing a strategy alongside the experts at One Earth. After that, we focused on setting up the organisational structure, communications plan and team development, with the creative team at Pearly and White and Elephant Brands. We Canada then launched at a fundraising event in Vancouver. During the last year, We Canada hosted two large entertainment and educational events. We Canada has two major areas of focus: Policy and public engagement. I initially focused on the public engagement side at the beginning of this year until our National Director of Eastern Canada, Marie-Pierre Daigle, joined and started leading the policy team. These days I am working on content and website redesign with One Earth and several talented coordinators in the public engagement team. Aleksandra (far right) with team members of We Canada. You have had a fascinating career: you were born and raised in Macedonia, then moved to Vancouver in your early twenties to study acting and have also worked as a model, TV host and producer. Now you can add Environmental Activist to your CV. Discuss. Ha ha! I remember politics always being discussed at the dinner table, and instead of cartoons we watched the parliamentary channel. Alright, soccer too. My parents were opinionated working class people. There were family members running for, and in,Parliament. Being engaged was inevitable. I got involved with the UN at a young age. I was invited to participate in public debates on the status of women. Then in my teens I was cast as the host of a youth culture TV show and developed a passion for storytelling, organising and producing. In Macedonia, I had several shows and other TV and film projects that prepared me for the work I do today. Then I won an acting scholarship for the Vancouver Film School. This opened the door to the industry and many invaluable friendships have since grown into partnerships with We Canada. For example, Sara Canning from The Vampire Diaries is one of our We Canada Champions. We met in acting class and helped each other out with lines. You never know where life will take you and who you meet – so always put your best foot forward and extend yourself to help. People such as the actors Aleks Paunovic and Patricia Isaac have not only became great friends but introduced me to a number of my closest friends today. I became the coordinator of the Vancouver South Asian Film Festival which Patricia co-founded and met the other co-founder, internationally acclaimed actress Agam Darshi, today a good friend and another Champion of We Canada. Modelling was an excellent way to see the world and get some fancy photos. I am also a massage therapist and worked on the Queen Elizabeth 2 during its round the world trip. That was one of the best experiences in my life at the time. You can never afford to leave Macedonia and travel that much, and even if you can afford it, the passport can’t take you past Bulgaria and Serbia. Get to know your self intimately and madly follow your heart. You have to remember that justice and equity are important. You have to want to be part of history. It’s exciting. There’s nothing else I would rather do. What with all of the high level organisational and strategic focus of your work, how do you stay motivated and motivate your team? I have a close group of twenty friends, mentors and advisers whom I rely on. You have to build a solid support network. I cry a lot and laugh even more. I run, I do Yoga, I rock climb, I bike to work everyday and swim. For my team, my best practice which is not always easy to do, is listening. You can’t talk people into a change. You can certainly listen them into it. That goes for engagement too. Listen to people and your life will change. I also love recognising the talents of my team and appreciating them. I genuinely ‘fall in love’ with my team members. They are some of the greatest people I’ve met! I try to remember that appreciation goes the longest way even though we forget. Giving people an opportunity to lead is the best way to keep people motivated. “People are inherently zestful and cooperative”, is my mantra. 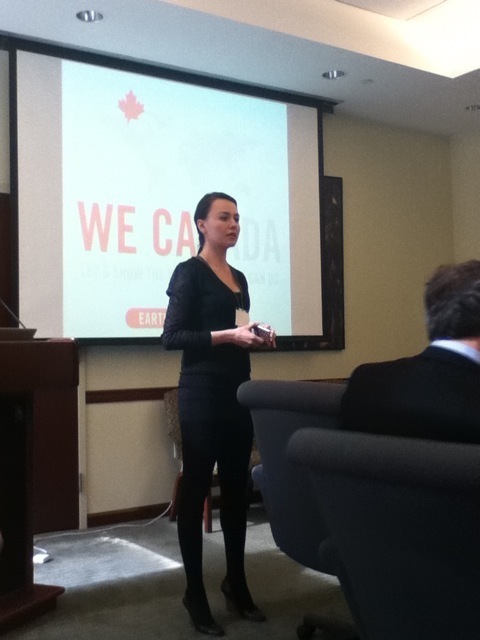 Aleksandra presenting a We Canada workshop. If you could emphasise three things the average citizen can do to lead a sustainable lifestyle, what would they be? Take care of Number One first – make sure you are in great shape mentally, emotionally and physically. Secondly, stop driving – fossil fuels and transportation is taken for granted. Thirdly, stop buying stuff which destroys our life support system and is a crime against future generations. What is the most rewarding part of your work? The most frustrating? The best parts are working in a team environment, creating, collaborating, observing the development of a team member and myself, being on a sharp learning curve, meeting some amazing people and making friends, like the One Earth team and Severn Cullis-Suzuki. The most frustrating part is feeling like you are back at square one after years of experience. And there are definitely moments like that. I’ve learned to welcome those too, as they are only an indicator of personal development. How has your Macedonian upbringing and culture influenced your view of the world and the way you live? My culture is very important to me. I think growing up in a country occupied by the Ottoman Empire for five centuries, then partitioned by its neighbours in the First World War and which eventually gained independence definitely helps you relate to other indigenous people. I grew up being taught to never forget who I am, who my ancestors are and not to flinch in the face of potential war, because justice will prevail. The history of my people is one about resilience and perseverance. It greatly empowers me to do the work I do. I am involved in Macedonian issues and take the time to advocate and educate my networks about Macedonia. I truly hope that we will persevere in the struggle to keep our identity. We are not a wealthy country. I grew up in a modest working class household and life was not easy, in the home and outside. Macedonia was going through transition. I appreciate every meal, warm shower, clean water and the bed I sleep in every night. And I want this for everyone in the world. It’s not too much to ask. Aleksandra in Vancouver, before she relocated to Montreal to lead We Canada. Oh dear, that’s a very hard question! Can I do three? Musaka with an alternative to meat (I make a delicious one! ), ajvar (Macedonian roasted pepper relish) and feta, and tavce gravce (Macedonian slow cooked bean stew in a terracotta pot). When I was growing up I thought Olivera Trajkovska the political journalist from The Red Line (Crvenata Linija) was fascinating – I am not sure what she is up to lately, but back then she seemed sharp, bold and absolutely gorgeous!